If you run an e-commerce website, then you already know how important site search is to your business. As websites grow more complex, visitors love to use site search to find products on your website. So, how good of a job does your site search do at connecting visitors to the products that they are looking for? Did you pause? :) In my opinion, site search analysis is a key component to understanding customer behavior and can greatly help enhance your online business. Google Analytics recently launched its Site Search functionality and I wanted to give an introduction to the functionality and reporting now available. 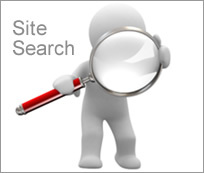 Why is Site Search Analysis Important? First, I’m assuming you have set up site search in your profile. It’s very easy to do and you can find instructions from Google here. Once you are logged in, click the Content tab in the left side navigation, and then click Site Search. You will be taken to the Overview page, where you are provided with several options. Let’s start with the most obvious report for site search, the actual keywords that your visitors are entering on your website. Total Unique Searches – This is the logical starting point. You can easily see the hot keywords on your website and then drill into them when you want to view more detailed reporting. You can also use the Analyze dropdown to select Search Term Refinement, which will enable you to see how visitors refined their searches after first searching for the selected keyword. Using the example I listed above, you might see that visitors started with HD TV, then added a manufacturer Samsung HD TV, and then added a screen type like Samsung HD LCD TV. The way visitors search may be completely different based on the categories of products you sell. You might end up refining your search functionality by category to enhance your visitors’ experience and to maximize sales. Interested in knowing which search terms result in a 0 search results page? This is not built into GA, so finding this takes an extra step. 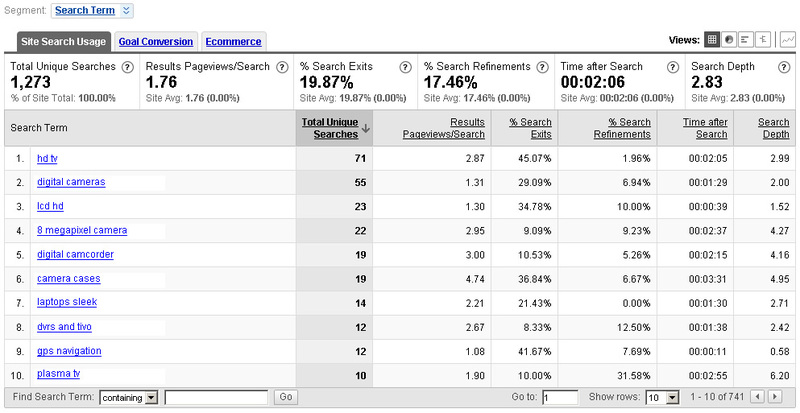 I typically start by finding high % search exits and then hit the e-commerce website in question to see the results. For example, if you see a 90% exit rate after the search for LG HD TV, you might want to check it out. Finding keywords like this can help you determine problematic search results (like if you really had LG HD TV’s!) It can also help you determine possible new product additions. If you don’t carry LG HD TV’s and you have a lot of visitors searching for them, you might want to consider adding them, right? You get the point! Site Search Usage – Let’s take a step back and look at the usage reporting. Click the Usage link under Site Search in the left navigation. You can see the number of visits to your site that utilized site search versus not using site search. Then you can use the dropdowns to analyze additional metrics. For example, use the dropdown to show revenue so you can see how much money was generated by visitors using site search. 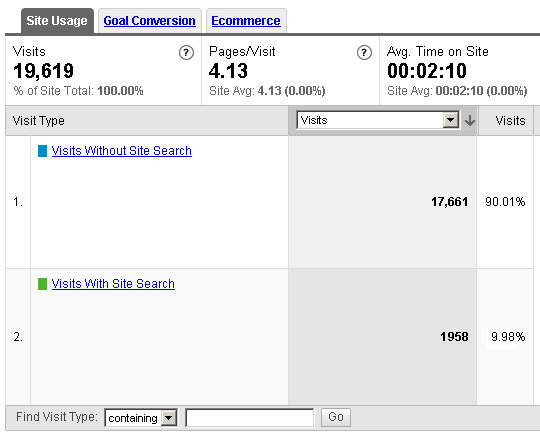 Or, you can view number of transactions from site search versus visitors not using site search. On the right side, you can view a pie chart based on visit type (visits with or without site search). For example, use the right dropdown to view time on site (for visitors who used site search versus not using site search). The Usage reporting is a great way to see how much value your site search is providing your business. Which Destination Pages Performed the Best? By clicking the Destination Pages link under Site Search in the left navigation, you can view all of the pages that visitors were taken to after searching for a keyword. You can quickly use the dropdown to view metrics for that destination page, such as revenue, total unique searches, complete orders, conversion rate, % search exits, etc. This is a great way to look at top performing pages versus poorly performing destination pages. For example, you might be able to find certain elements, calls to action, visuals, etc. from a top performing page that you can apply to poorly performing pages. You can also drill into each page to see the keywords that led to the page. 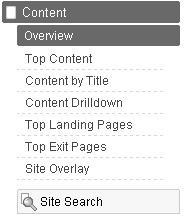 And, you can still use the dropdown up top to view key metrics (now by keyword versus destination page). To view the pages where searches on your website originated, click Start Pages under Site Search in the left navigation. So, why did searches originate from these pages? Is there something you can do to enhance certain pages? Do any of those pages also have a high bounce rate or exit rate? You can click any of the start pages to view the search keywords that visitors entered while on that page. For example, you might find a category landing page with searches for products not listed on that landing page (even though they are part of that category). If you see enough of a demand for certain products or subcategories, you might try adding them to the landing page. Remember, you want to connect your visitors with the products they are looking for as quickly as possible. If you can take a barrier away, like having to search for the product, then do it. Small adjustments might reap great rewards. The last set of reporting I’m going to cover is Site Search Trending, which can be found under the Site Search tab in the left navigation. By clicking the link for Trending, you can easily see data over time for key metrics in site search. Using the Trending dropdown at the top of the report, you can view visits with search, % search exits, % search refinements, search depth, etc. Keep in mind, this reporting is top level and not for specific searches. It will give you an overall snapshot of how your site search functionality is working. For example, let’s say you’ve had a slight problem recently with visitors not being able to easily find your search box. So you made some changes to its location and want to see if that change affected the percentage of visitors using site search. This is a great report for finding information like this… The trending graph enables you to easily view data over time. That was just a quick example, but I wanted to make sure you understood that Trending was at the site level when looking at this report. I hope this post helped introduce Site Search Analysis in Google Analytics and gets you excited about digging deeper. Let’s face it, if someone is searching for products on your site, you don’t want to lose them… To use the retail sales analogy I explained earlier, visitors who are using site search are actually giving you feedback. The problem is that they aren’t directly giving the feedback to you! You need to channel their approval or frustration through your site search reporting within Google Analytics (or other web analytics packages). It can help you reveal what’s working and what’s not working. You might be surprised what you find! This is Part II of my series about e-commerce imaging functionality at LandsEnd.com. In my first post, I explained how the pan, zoom, and view funtionality is some of the best I have seen on the web. This post is about something much more important, at least in the long-term. When you browse LandsEnd.com and view a product detail page, you will find a link labeled “Try it on”. After clicking that link, you will be taken to a virtual dressing room where you can utilize an application called Dressing Room by My Virtual Model. My Virtual Model is a virtual identity company located in Quebec, Canada. Lands’ End has actually been using this functionality for a while, but I wanted to explain more about it since I believe it gives us a glimpse into the future. “You’ll be watching your favorite show (probably not on a major network, but on your favorite online channel), and you’ll notice that one of the actors is wearing a shirt that you like. You’ll click that shirt, the show will pause, and options for learning more about that shirt will pop up. You’ll be able to drill into that item to see a hologram of the shirt so you can truly get a better look at the product (right in front of you and in 3 dimensions). You’ll choose your size, color, etc. and click buy. The show will resume, and your shirt will be delivered the next day (and not in 5-10 days! )” Am I crazy to think that? No, that’s where we are heading. Sounds very Minority Report, doesn’t it? I’ve played around with this functionality extensively over the past week and have provided a breakdown below. It was definitely helpful and very cool, so let’s take a closer look…. Clicking the “My Fit” button enables you to customize your height, waistband, inseam, chest size, neck size, sleeve length, seat, thigh, and age. Click “Save” and your settings will be retained by My Virtual Model. Side Note: For those of you looking to lose weight, this could be an eye-opening experience… Be prepared to see a virtual you, down to the poundage! Getting a Good Look at the Clothes That Your Virtual You is Wearing…Or You are Wearing…Oh Heck, You Know What I’m Talking About! Now that your model is set up, click the “My Virtual Model” tab. Now you can start trying on clothes. There are dropdowns for category, subcategory, and then products within that subcategory. 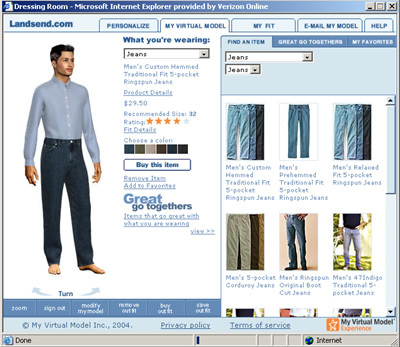 For example, I selected Jeans and then clicked the first pair of jeans that showed up. 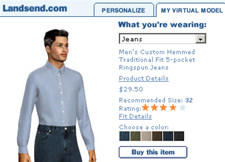 The virtual model is now wearing the jeans I selected. Then I could select the color of the jeans, which showed up in real-time (real-time processing is an option in your account). Then I selected Dress Shirts and clicked the Hyde Park button down. So far, so good. But what if you want to get a better look at the outfit? No problem, just click the “turn” arrow buttons at the bottom of the screen. You can turn your model either clockwise or counterclockwise to view the outfit at different angles. Very cool. Want a closer look? Click the “Zoom” button on the bottom toolbar and you’ll see a much larger model in a new window. You can turn your model here, as well. There are times where you need some help figuring out what matches the selections you’ve made. 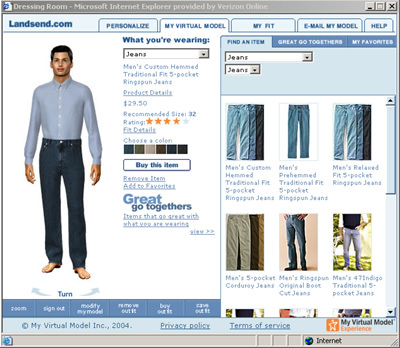 My Virtual Model enables retailers to provide this functionality in what they call “Great Go Togethers”. If you choose a category and then click “Great Go Togethers” on the right side of the screen, you will find product listings and then other items that match. So, if you don’t have much time and want recommendations for an entire outfit, this is the place for you. For example, I chose a dress shirt, selected the pants, and shoes that LandsEnd.com recommended and I had an outfit built in 10 seconds. 1. The clothes look better in photographs and in real life! Clicking “Buy this Outfit” while in my virtual dressing room took me to a screen where you can select your options for each product in the outfit, but the “add to shopping bag” button wouldn’t work. I tried this a dozen times on multiple systems and it simply wouldn’t work for me. The “Buy this Item” button worked, but if you want to buy the entire outfit, it wouldn’t work…This could be a serious “conversion killer” so if I was in marketing at Lands’ End, I would take a serious look at this. Hey, that really doesn’t really look like me… Thank you Captain Obvious. ;-) I know it can’t look just like me, but I’ll bet this can be a hangup for some people. I guess the easy way to alleviate the issue is to simply provide more options for customizing your virutal you. If you are interested learning more about how this works, then you should try it out on LandsEnd.com. The functionality is definitely a step in the right direction for online shopping, but it needs to work perfectly for it to become mainstream. I know the industry will get there…but it’s just going to take some time.